Platinum is reported to promote healthy tissue regeneration. It is believed to increase the electrical transmission across the synapses within the brain to improve memory, increase mental alertness and promote general tissue regeneration of the neurological tissues. The primary metal of the platinum group metals useful for a healthy body, also known as the PGMs. Platinum itself functions as a bridge between cause and effect - if something causal were introduced into the body, there would naturally be an effect, but which might come about at a cost of efficiency and optimal performance. 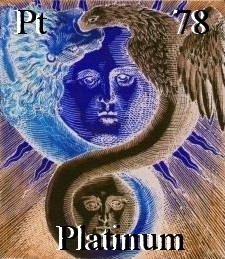 Platinum flat-out maximizes the efficiency and optimization of cause and effect, not necessarily removing the barriers between the two, but becoming the unrestricted conduit. Platinum also tends to function as an insulator. For example, as long as it's in the body either less sunscreen or none at all, would be needed because it's also involved in processing sunlight as a nutrient. In some people, it might even help in the relief of allergies. Platinum, a very shiny metal, works like gold in bringing a shining and confident you to the surface, and also builds an inner strength that equates to your recognition of that true inner beauty. It’s a very balanced metal which is the reason why it is represented by both the sun and the moon. Platinum tends to create this expansive reaction within you, giving you exuberance, an inner thrill that you might not have felt since being a child. Cisplatin is a unique anti-cancer agent. It's development began in the 1960's, as it often did in those days, purely by accident. During an experiment done to see what happens to bacteria in electrical fields, it was noticed that the bacteria had stopped multiplying. It seems they had been poisoned by something that was leaching out of one of the electrodes used to create the electrical field. The substance was identified as platinum. Anything that can poison cells and keep them from growing holds potential promise as a chemotherapy drug. Cisplatin (which contains platinum) was tested against a diversity of tumors. Overall, it proved of little long-term value, except it appeared astoundingly successful against one particular type of tumor, testicular cancer. A regime that involved combinations of cisplatin with other chemotherapy drugs was pioneered in the 1970's by Dr. Lawrence Einhorn at Indiana University. Although the combinations were effective, they were highly toxic. Many patients died or never fully recovered from the effects of the therapy. Over the years the ciplatinin-based combinations have been refined. They now yield remarkable results. The current cure rate for testicular cancer in all but the most advanced cases is in the neighborhood of 95%. Lance Armstrong had advanced disease with metastases to distant sites. Given the facts of his case, his chances for a cure were estimated at no better than 50%. But then again, few would have predicted Armstrong would race a bicycle again. In the Tour de France? And win it? Life is full of wonderful surprises, including Platinum.